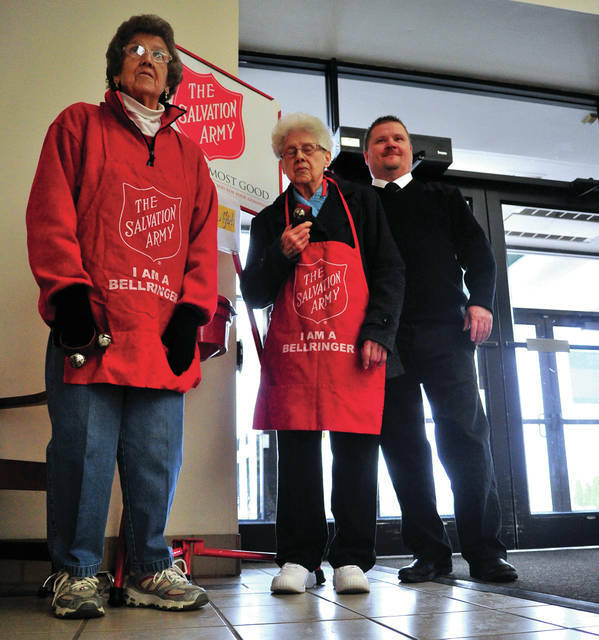 Mike Ullery | Daily Call Donna Lemmon, 84, and her sister Norma Lyons, 92, man the Salvation Army kettle at the Miami Valley Centre Mall on Friday along with Major Robert Kramer of the Piqua Salvation Army. The mall is one of nine locations in Piqua, and two in Troy, where bell-ringers continue the 128 year old tradition of raising money for those in need. Major Kramer said that, in spite of the upturn in our economy “there are still many in need” of help around the Christmas season. Donna Lemmon, 84, and her sister Norma Lyons, 92, man the Salvation Army kettle at the Miami Valley Centre Mall on Friday along with Major Robert Kramer of the Piqua Salvation Army. The mall is one of nine locations in Piqua, and two in Troy, where bell-ringers continue the 128 year old tradition of raising money for those in need. Major Kramer said that, in spite of the upturn in our economy “there are still many in need” of help around the Christmas season. https://www.dailycall.com/wp-content/uploads/sites/30/2018/11/web1_113018mju_salvationarmy.jpgMike Ullery | Daily Call Donna Lemmon, 84, and her sister Norma Lyons, 92, man the Salvation Army kettle at the Miami Valley Centre Mall on Friday along with Major Robert Kramer of the Piqua Salvation Army. The mall is one of nine locations in Piqua, and two in Troy, where bell-ringers continue the 128 year old tradition of raising money for those in need. Major Kramer said that, in spite of the upturn in our economy “there are still many in need” of help around the Christmas season.